Polaris-owned Indian Motorcycles came back to form with a bang with the all-new Chief line of motorcycles powered by their also all-new Thunderstroke 111 1,819cc V-twin engine last year. 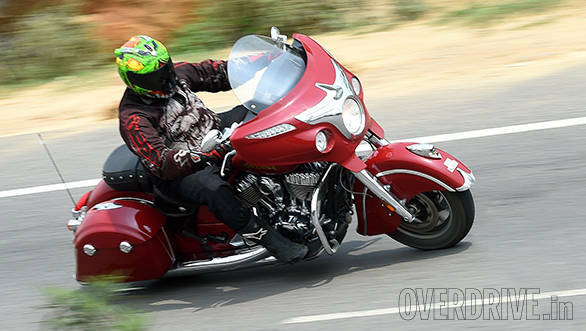 The base model is called the Chief Classic - it's a naked cruiser, priced at Rs 26,50,000 on-road Delhi (Read our first ride impression of the Classic here). The middle model is called the Chief Vintage. It adds a tall screen mounted on the front forks, tan leather seat and matched leather saddlebags to create a lovely retro-themed cruiser. This is priced at Rs 29,50,000 on-road Delhi. The top model, of course is the Chieftain. We were the first Indians to ride it (see the story here) and now we've ridden it here in India. 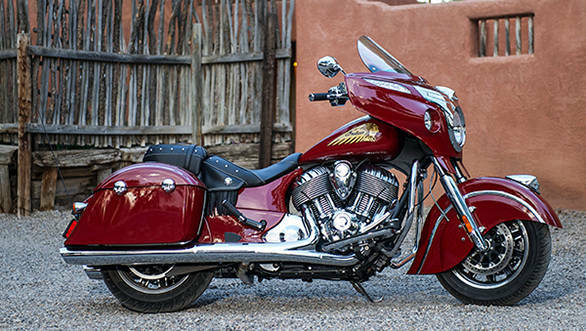 The full story of the Chieftain ride is in the September 2014 issue of OVERDRIVE but here is what you should know about the bike before you put your money down. Cruisers are meant to be motorcycles that are laid-back in nature and easy to ride. So while the Chieftain (and indeed the Classic and Vintage) are massive motorcycles of impressive girth and length, they're designed to be easy to pilot. 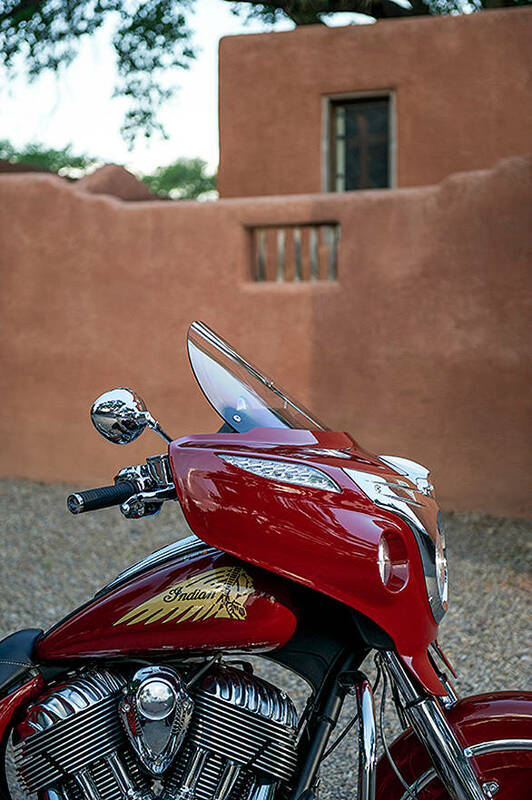 When you sit on it, you'll feel the stretch to the bars and at walking speeds, the Chieftain can feel like it is a handful and that you need a smaller motorcycle. But I would say give it five minutes more and wait for the feeling to come to you. Because the Chieftain is actually a pussycat of a motorcycle. You'll quickly find your feet and be able to wield it as naturally as you might a much smaller motorcycle in both displacement and size. It has a very sweet nature and you'll become convinced that despite its size, the Chieftain isn't actually trying to embarrass or kill you. In fact, the Chieftain has a slight change of steering geometry to accommodate the huge fairing that actually makes it easier to handle and manoeuvre than the other two bikes. As you can see in the image, the Chieftain has a multi function display mounted between the meters on the fairing in front of you. The top bar shows time and temperature but the middle bar can be annoying. Because it shows various things. The tyre pressure readout is useful but when the bike suddenly shows you the time since the last oil change and how much oil is in the engine, you wonder if the bike is really telling you it needs an oil change or not. This is mildly concerning until you learn to ignore the barrage of information. On the other hand, the instrumentation is comprehensive and you'll hardly be able to come upon an idea or aspect of instrumentation that Indian should or could add to the bike. We didn't spot one in the official Indian Indian catalogue, but if you intend to use the pannier out on the road, get pannier bags. These are a piece of luggage that will fill the Indian's panniers. This makes it easy to pack because you can fill these bags in your house before you put them in the pannier and lock them. It also makes it easier to carry your stuff into your room at the hotel when you stop for the night. The panniers are waterproof (tested) so the pannier bags do not have to be. But we discovered that if you don't have a pannier bag, you end up with an unwieldy mess of plastic bags each night which you have to deal with every morning before you can ride. It's seriously plush on good roads and terrifically absorbent on bad ones. The Chief has an uncanny ability to flatten roads and your bum will thank you for it when the roads turn out a lot worse than you thought. Amidst all this, the panniers will never rattle and it all adds up into a ride experience that goes with the majestic, outsize look. The screen in front of you is electrically adjusted via a rocker button next to the left bar grip. But we found it hard to find a good setting among three riders spanning 5'6" to 6'3". Of course, we all ride in full face helmets with varied aerodynamics so your helmet will alter your comfort levels. 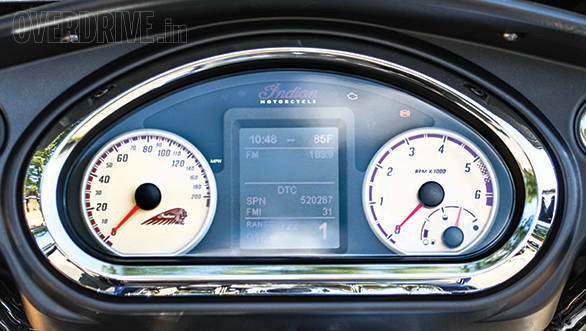 But if you're taking a test ride, we suggest you find the space to run a couple of 100-120kmph runs with the screen at various heights to see how the buffeting affects you. One of the issues of buying a product, no matter how excellent, from a new company is that they've just started and so the reach is small. This is especially true in geographically large countries like ours. Indian's setup in India is the youngest amongst all the motorcycle makers and so their ability to reach you when you need help is constrained by their youth. This doesn't mean that you'll be stranded without help, but it does mean that Indian India will take longer to reach you depending on how far you are from their nearest dealership - as of press time, they only have one dealer in Gurgaon.